Markets are growing bearish as this year’s refinery maintenance season has thus-far brought larger crude builds than expected, keeping downward pressure on prices. As we noted earlier this week, from June through October last year, US crude stocks increased by 56 million barrels; this year, stocks fell by the 55 million barrels over the same 5-month period. Markets also had a huge shift occur in future sentiments, which bodes bearish for markets. 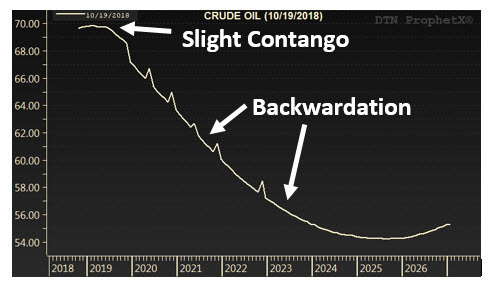 We’ve written before about backwardation and contango – two futures market structures that signal how markets view forward prices. 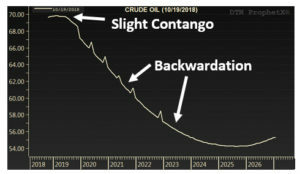 Backwardation means that future prices are lower than current prices, while contango means future prices are higher than present prices. Counterintuitively, backwardation (in which future prices are lower than present prices) is bullish for prices, for a variety of financial reasons we won’t get into here. This past week, WTI crude flipped from a steep backwardation to a slight contango, at least in the short term. 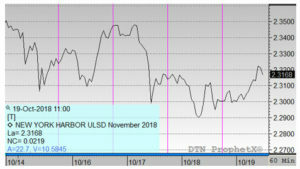 While the overall curve is still declining (backwardated) in late 2019 and beyond, the short-term sentiment is changing to be slightly more bearish that before. Brent crude, on the other hand, remains fully backwardated, meaning no short-term bearishness. The difference suggests that internationally, buyers are worried about Iran sanctions, but American buyers are less worried about supply outages in the short term. What does that mean for prices in the future? Generally, contango is bearish, but given correlations between Brent and WTI, we’ll see which one plays a larger role. Most traders in the market are fearful of November’s sanctions on Iran, keeping most of the bears on the sidelines until then. Crude prices saw a large mid-week drop related to EIA inventory data and overall bearish concerns in the market related to demand. WTI began the week at $71.85, but fell on Wednesday below $70/bbl, the first such decline since mid-September. This morning crude opened at $68.68, a loss of $3.17 (-4.4%). Diesel prices also saw a mid-week decline, though significantly smaller than crude’s loss. Diesel prices began the week at $2.3323 and traded as high as $2.35 before crashing down below $2.30. This morning, diesel prices opened at $2.2987, a loss of 3.4 cents (-1.4%). Gasoline prices opened the week at $1.9507, rising to just shy of the $2.00/bbl mark before reversing lower. This morning, gas prices opened at a mere 1.8911, down 6.0 cents (-3.1%) lower. 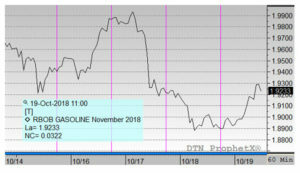 A gasoline inventory draw that failed to meet market expectations on Wednesday, caused gasoline losses to outpace diesel losses.